Fleetwood Mac have announced dates for an extensive North American tour following their recently-revealed split with longtime guitarist Lindsey Buckingham. "Lindsey Buckingham will not be performing with the band on this tour,” said the group in a statement earlier this month. “The band wishes Lindsey all the best." 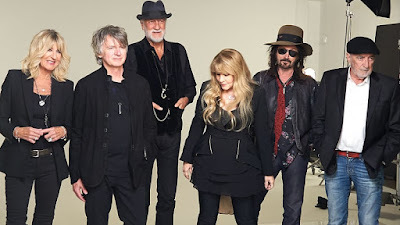 Billed as “An Evening With Fleetwood Mac”, the 2018-2019 trek will see the band play more than 50 cities across the continent with the newly announced line-up of Mick Fleetwood, John McVie, Stevie Nicks and Christine McVie along with newcomers Mike Campbell (from Tom Petty & The Heartbreakers) and Neil Finn (Split Enz, Crowded House). Fleetwood Mac will begin the first leg of the tour in Tulsa, OK on October 3, with shows running to mid-December before resuming the series for another two month run in Houston, TX on February 5. An American Express Card Members presale is open from Monday, April 30 at 10am through Thursday, May 3 at 10pm, with general public seats available Friday, May 4 at 10am local time.